Retail Shopping - What will it look like in the future? Home > Blog > Retail Shopping - What will it look like in the future? From the Jetsons and Buck Rogers to Back to the Future and Minority Report, futuristic TV shows and films have, for a long time, provided glimpses of where everyday technology was heading. And now, almost two decades into the 21st century, we're seeing some of these ideas come to life and others we never expected. That includes retail shopping technology. test new technologies that offer a smooth transition between the physical and online worlds. Here some of the amazing ways technology and retail will work together and examples of how some progressive businesses are already putting them to use. AI is already reshaping retail marketing. Marketers are using it to collect data, analyse and predict customer behaviour, and provide buying suggestions. For example, at Amazon Go grocery stores, shoppers scan their smartphones when they enter to identify the products that they take off the shelves and keep track of the virtual cart. Marketing campaigns, based on shopping habits, can be delivered to phones while customers are in-store. And these can be measured based on dwell time, conversion, location and loyalty rates. After the shopping is done - no lines, no check out - the payment is charged to their Amazon accounts. Chatbots and virtual agents are currently used in customer service and support and are also being developed to help customers make purchases. Starbucks uses chatbots to help facilitate customer purchases. While they do so, they can also track customer purchases, behaviour, and preferences which are then used to identify the popular products. Imagine a retail store without shopping carts, shopping bags, in-store inventory and checkout lines. Virtual stores can pop up anywhere with large screens showing goods or virtual displays in physical stores showing stock that can't fit on the shelf, or isn't available at the store. Tesco set up a virtual shop in the Seoul metro. Passengers could order groceries off real-looking digital shelves. They scanned the goods into their smartphones on the way to work. By the time they got home, the goods had been delivered. Bonobos is a men's clothing e-commerce company in the US that wanted to give customers the tactile pleasure of shopping for clothes. They opened several Guideshops in major cities that offer samples for customers to try on before placing orders online. The goods are shipped straight to your home or office. Fashion brand stores like Rebecca Minkoff are not just trying to revamp their space with controlled soft lighting, plush seating and lots of space, but next frontier technology which can show customers multiple options as they try on clothes and accessories. Soon, all retail shops will have dressing rooms that come with interactive touch screens allowing customers to purchase the clothing they are trying on in different sizes. And look great in the process. 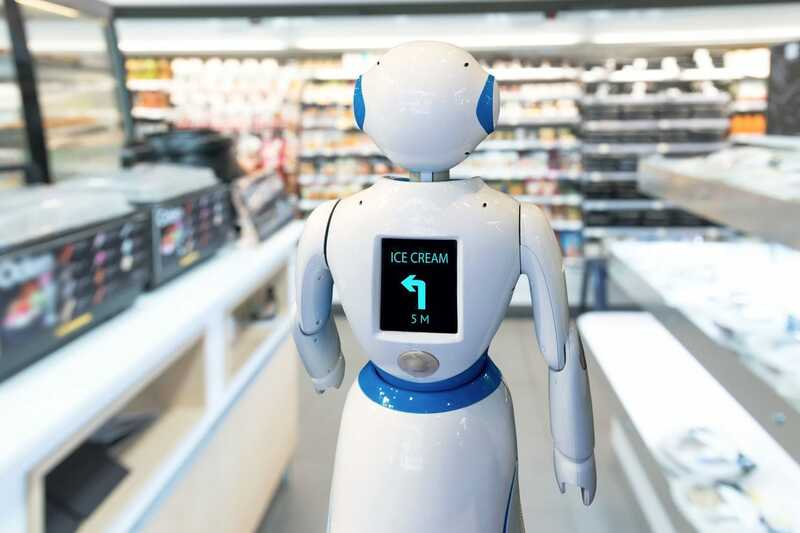 It won't be long until robots will be picking and bagging groceries for you or rolling up and down the aisles making sure the shelves are stocked. The Lowe's home improvement chain has already rolled out a customer-service robot named LoweBot that makes sure the shelves are well stocked. A shopping experience completed with facial recognition can be used to analyse shoppers' behaviour. In other words, what they buy or what catches their attention. Facial recognition is also being used for security, to quickly identify suspected shoplifters and alert the store security system. Walmart is tracking changes in facial expressions and movements to identify when a customer is unhappy and to keep a record of customer spending behaviour. A different kind of amusement park ride - technology that gives customers personal skincare tips and lets them see how they look with different shades of eye-shadow or lipstick? These smart mirrors help brands understand which products are being tried on, or not bought, or being styled together. The British cosmetics company, Charlotte Tilbury, has a magic mirror that allows users to virtually try on different looks that are digitally superimposed onto their faces. Many of these new technologies are developed to help businesses better understand and service their customers in-store and online - wherever and whenever the customer wants to connect. Learning about what's coming, what's possible now and how you can start testing some of these ideas in the year ahead, will help give your business a unique angle and customer benefit over the competition.